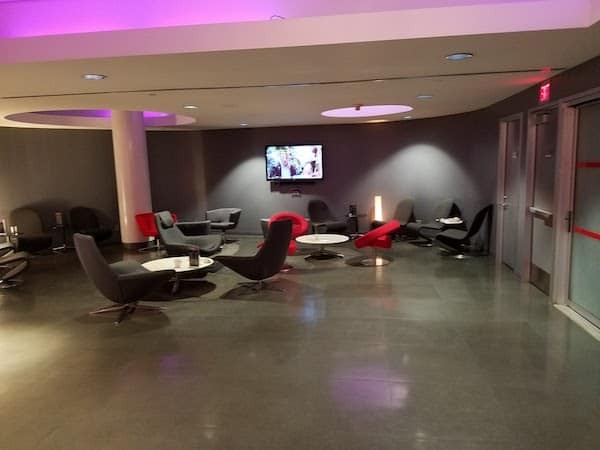 Virgin America has a total of one airport lounge, the Virgin America Loft in LAX at Terminal 3. And soon it will be no more. Delta plans to take over Terminal 3 at LAX and Virgin America will be moving to Terminal 6 with their new owners, Alaska Airlines. Thus the Virgin America Loft will be closing for good. It will fade into the history books of air travel in a few short months. So I decided to pay it a visit on a recent trip through LAX. First of all, currently Priority Pass holders receive free admission to the lounge. 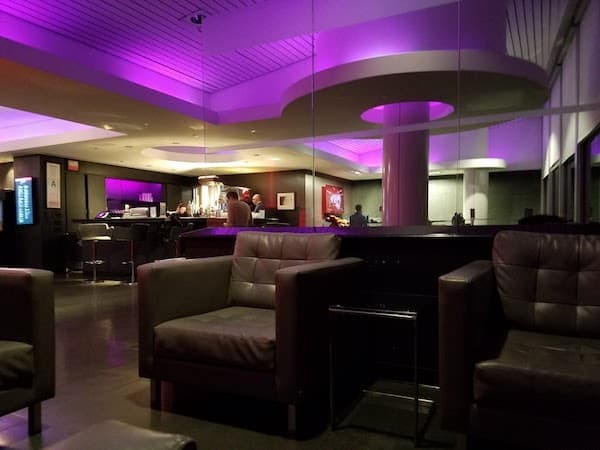 You can also receive free admission to the Virgin America Loft if you are an Elevate Gold member of ticketed in First Class flying Virgin America that day. Elevate Silver members pay $15. Any one else traveling can gain access for $30 (down from $40 when it first opened). 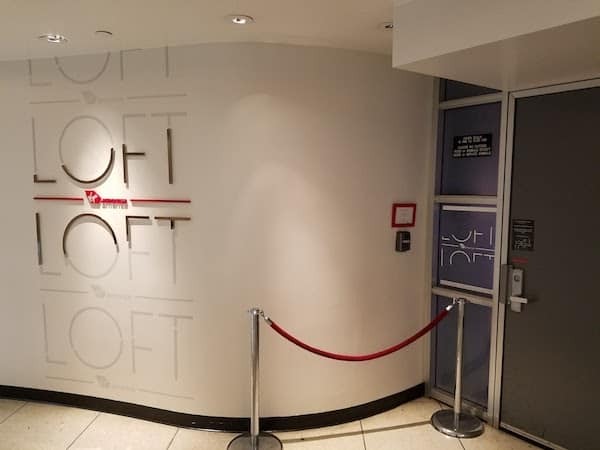 The Virgin America Loft is located on the second floor of Terminal 3 at the end of the terminal past the food court. It is hard to find, to say the least. 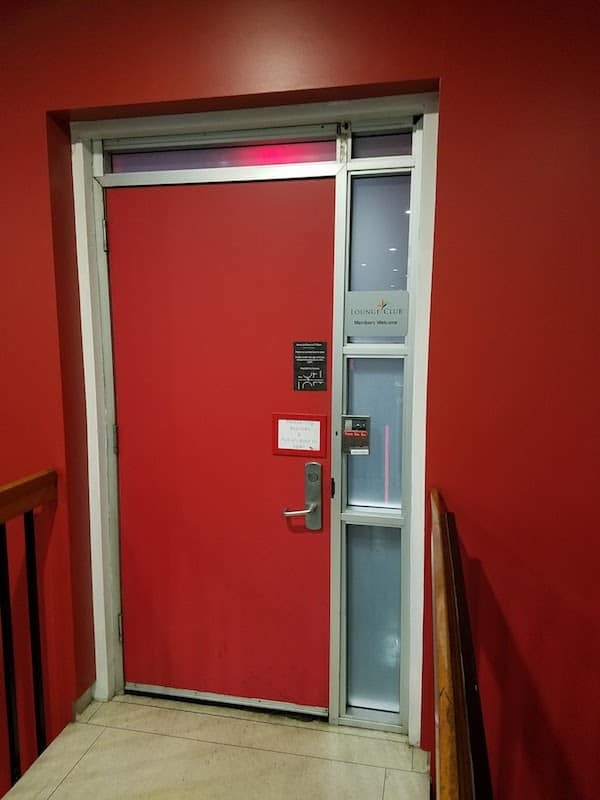 There is an elevator you can take the second floor. You can also find a staircase to the back entrance by Gate 31. It isn’t the most inviting of airport lounges; you have to ring a doorbell and have the staff buzz you in. The Loft only opened 4 years ago but it already feels quite dates to me. It seems like they went for sleek modern furniture at clearance prices. The lighting is fun and there is a bar where you can order drinks (free beer and wine, paid cocktails) or a limited food menu. 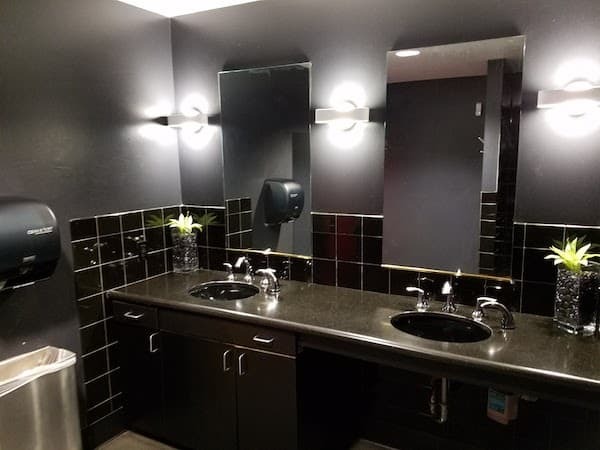 The bathrooms felt particularly dated to me. The black ceramic felt very 1980’s to me. Maybe they were going for a throw back of some sort? The food options were quite disappointing. There was some whole fruit, cookies, and crackers. There is a self serve soda machine as well as coffee and tea by the bar. 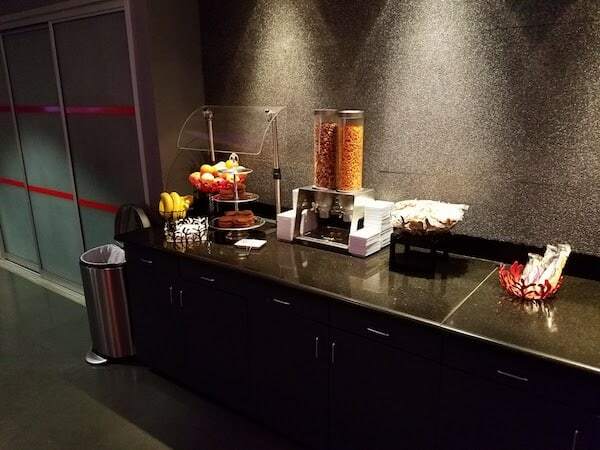 When I visited before taking the last Virgin America flight for the night, the lounge was pretty quiet. And if you get a window seat you can have some nice views to pass the time. 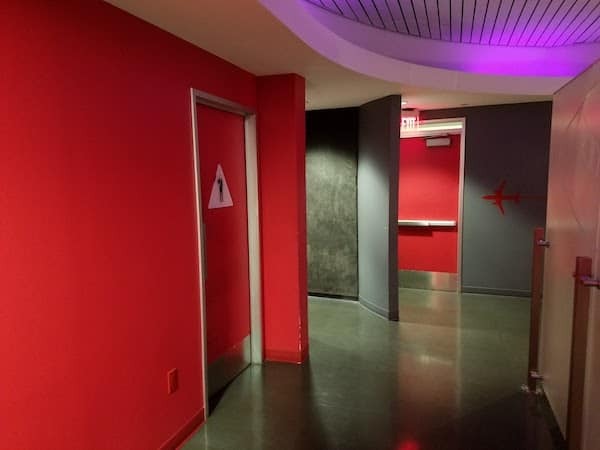 It is pretty clear that Virgin America has not put much money into the Virgin America Loft since it opened. The rumors of Alaska Airlines purchasing Virgin America started not too long after the lounge opened; and at this point it’s days are numbered so I think they are just letting it go. It is scheduled to be replaced by a brand new Delta Club. In the meantime, if you are passing through Terminal 3 stop by the Virgin America Loft because it won’t be there much longer. Just don’t go out of your way to visit. 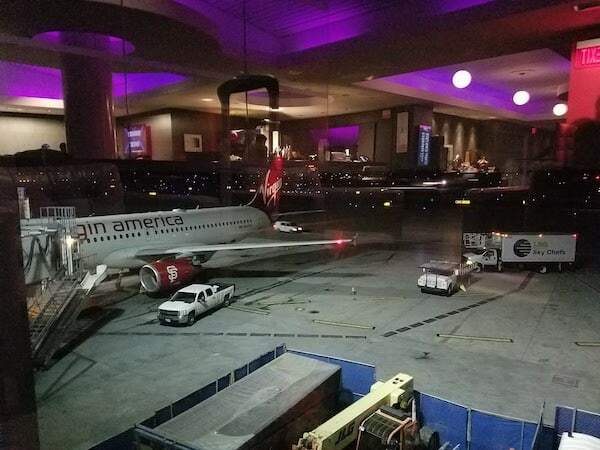 The Virgin America Loft LAX is now closed at Terminal 3. Virgin America moved to Terminal 6 and Terminal 3 is going through a remodel for new tenant Delta.